Though 2011 was the year of dual-core, 2012 will bring quad-core processors to smartphones. Nvidia’s Tegra 3 processor is said to be five times faster than the dual-core Tegra 2, which debuted this year. Qualcomm, meanwhile, is planning to launch quad-core Snapdragon CPUs with speeds up to 2.5GHz, and with quad-core Adreno graphics processors for gaming. Using an NFC-equipped phone to pay. Google Wallet got a head start on the pay-by-phone front this year, but it will have lots of competition in 2012. Wireless carriers have banded together on their own NFC payment plan, called Isis, and Apple is rumored to be putting NFC in future iPhones. Research in Motion has included NFC capabilities in its BlackBerry Bold 9900 and the BlackBerry Curve 9350/9360/9370. Don't expect NFC to kill the credit card next year, but do expect plenty of retailers to accept NFC payments by year's end. The Samsung Galaxy Nexus and the HTC Rezound are among the first smartphones to boast 720p (1280-by-720-pixel) displays. Next year, 720p resolution will become the standard for high-end smartphones, and handset makers may even figure out how to fit those pixels into even smaller screens than the 4.3-inch display in the Rezound. The result should be beautiful smartphone screens whose individual pixels are impossible to tell apart. Even though the fight for smartphone superiority mainly involves the major wireless carriers, a separate battle is brewing on the contract-free front. Sprint's Virgin Mobile brand and T-Mobile's no-contract plan through Walmart are the main combatants, offering decent Android smartphones for $35 per month and $30 per month, respectively. Expect strong follow-ups to Virgin’s Motorola Triumph and T-Mobile’s Samsung Exhibit II 4G as prepaid carriers go to war. While smartphones will continue to improve noticeably in processor power, screen quality, and data speeds, their battery life is likely to see only minor improvements. The major technological breakthroughs that could keep users from worrying about getting through the day are still in the laboratory, so the best hope for better battery life lies in optimization. Nvidia’s Tegra 3 processors, for instance, have a hidden fifth core that draws a small amount of battery life for basic tasks, and the Motorola Droid Razr can turn off battery-intensive functions automatically to conserve power. For now, however, the true 24-hour battery is still a dream. 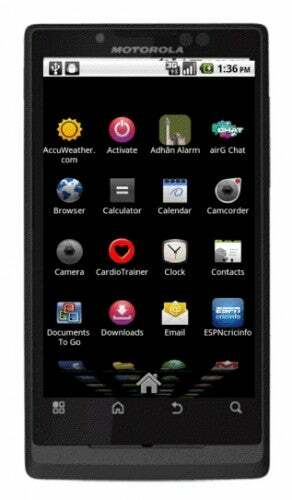 The Motorola Triumph is one of the best prepaid phones you can buy.